The global community faces a daunting energy task, due to fuel concerns. Particularly, large quantities of cheap coal has been used to power industries, leading to CO2 emissions and global warming. In today’s world, there is an urgent need for a clean and recyclable fuel source that is sustainable. Here, we showcase a route to convert coal into a sustainable and mobile fuel source. 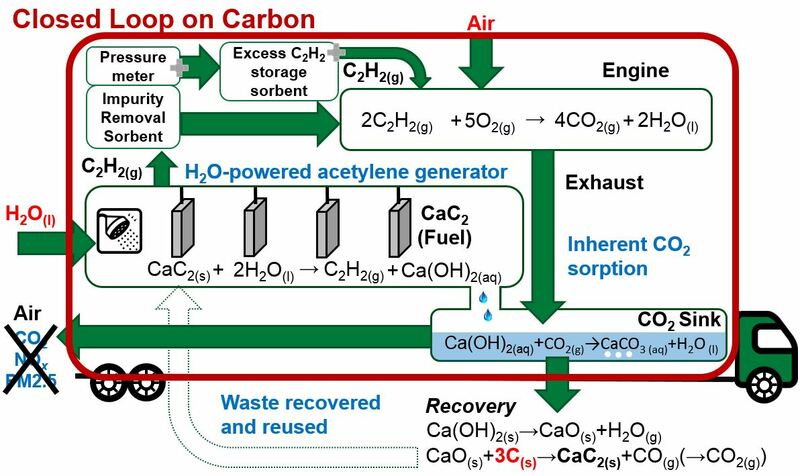 Chemistry of CaC2 with water produces acetylene in situ and the generation of calcium hydroxide: the former is a fuel source, while the latter is a CO2 sequestration agent. This raises the prospect of a zero emission engine. CaC2 is inert to heat and is an inherent solid state storage of the acetylene, making it a suitable candidate as a mobile fuel. The CaC2 fuel is also logistically friendly due to the high volumetric energy density, incombustibility and is non-poisonous, with acetylene being produced-on-demand. It is also economical due to its non-petroleum origins. Our team demonstrate a framework towards designing a water powered acetylene engine, which is self-sustained with CO2 trapping capabilities. The entrapped CaCO3 can be used as feedstock for CaC2 generation or remains as a CO2 sink. 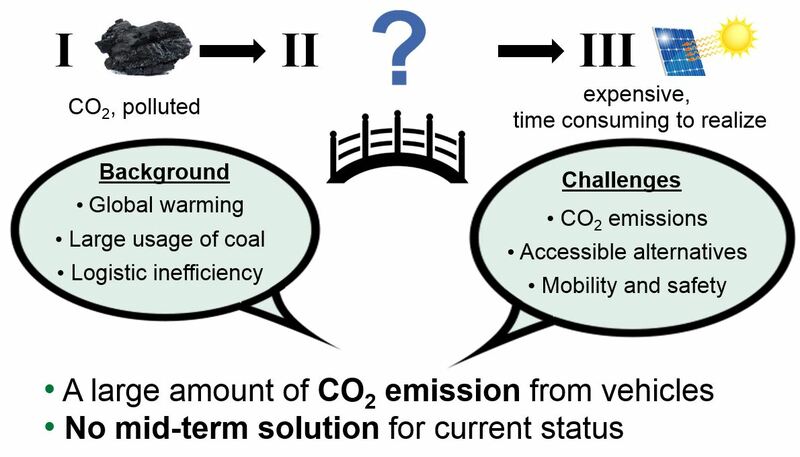 The novelty of this proposal lies in the conversion of coal to a mobile fuel, where carbon is self-contained during CO2 sequestration. Nowadays, global warming has become a serious problem in our living environment. Moreover, emerging countries need a huge amount of energy and they mostly use coal to sustain their development, causing air pollution. There has been increasing CO2 emissions due to petroleum fuels. This is due to the insatiable thirst for energy, with challenges of increasing carbon dioxide emissions made more compelling with an aspiring middle class who have increasing demands for energy for their daily needs. Transporting such fuels across continents is logistically inefficient and results in waste of fuel. Therefore, to sustain our living environment, an accessible and zero emission alternative fuel is desirable. We also want the transport of these goods to be convenient and safe. In today’s world, there is an urgent need for a clean and recyclable fuel source in urban transport that is sustainable. Conventional cars dumps tonnes and tonnes of CO2 into the atmosphere. Meanwhile, 41% of the world’s electricity is generated by coal burning. This causes serious global warming as CO2, consists of nearly 55% of all greenhouse gases. An alternative energy is urgently needed. Moreover, coal, an inherently stationary fuel, is hardly a mobile fuel. Scheme 1. Transition between the age of the sun and the age of coal. There is still a gap between the age of coal and the age of sun, where many predicts a hydrogen economy and an electrical era, as illustrated in Scheme 1. The transition between these two stages has not been addressed. In this interim period, we hope to address this pressing issue, with an alternative energy proposal. The motivation is to build towards a fuel which has zero emission, as an accessible alternative that is accompanied with mobility and safety. Challenges of carbon dioxide emissions and increasing needs of cheap energy remains, where coal - a stationary fuel feature strongly. It is imperative for us to reinnovate and find an abundant source of energy with high calorific value and most importantly - a green source. Scheme 2. Corporate average fuel economy (CAFE) requirement. The corporate average fuel economy or in short, CAFE requirement is a global obligation for motor companies to reduce 5% CO2 emission annually which is a burden for the automotive industry, as illustrated in Scheme 2. Therefore, the an alternative energy proposal must be such that it uses the current infrastructure to reduce CO2 and represents savings for the company for future investment. This notion will feature strongly in our project proposal. Accessible: To be affordable for vehicles in developing countries. Sustainable: Emission-free, through active recycling and reusing of the components in the fuel. Efficient: Easy to transport and allow the fuel to be produced in situ on site. Therefore, converting coal into mobile fuel propellant, which is recyclable and green, is desirable. The inspiration arises from the CaC2 lamp, which slowly burns off the acetylene that it produces. CaC2 was discovered in 1892, with the reaction of limestone and coal, and was used in carbide lamp. Chemistry of CaC2 with water produces C2H2 (fuel source) and the generation of Ca(OH)2(CO2 sequestration agent) in situ. Calcium hydroxide is a sorbent to trap CO2, preventing being released to the air. Waste can be recovered and reused to make a closed carbon loop, raising the prospect of a zero emission engine. Furthermore, CaC2 is inert to heat and is an inherent solid state storage of C2H2, making it suitable for a mobile fuel. C2H2 has a positive enthalpy change of formation, where energy investments are returned during combustion. Therefore, a design of the water-powered acetylene engine is self-sustained with CO2 trapping capabilities: to replace conventional gasoline engine and to reduce CO2. Water is sprayed onto the solid CaC2 substrate to produce C2H2 gas. The gas is then supplied into the system for combustion. We also have designed an impurity removal sorbent, pressure meter, C2H2 storage sorbent to ensure safety and incombustibility. The heat of combustion of acetylene is at -49.9 kJ/kg. We introduce a CO2 sequestering system by the Ca(OH)2 produced in situ to remove most of the GHGs at the source. At the factory, 95 % of carbon dioxide can be captured using conventional carbon dioxide scrubbing machines on site in the factories. While in the mobile vehicular units, 32% of the carbon dioxide can be captured in a one-tiered system. Higher number of tiered carbon capture systems within the same Ca(OH)2 bath will be able to remove more of the CO2. Effectively, this makes it a zero emission engine. Ca(OH)2 is an inherent absorber of CO2. Upon recovery, it can be used as a carbon sink or to be reused as a substrate to charge the acetylene fuel into the system. In this close loop on carbon, with the accompaniment water, air, the carbon is entrapped within the cycle, arriving at zero carbon emission. CaC2 is extremely cheap at USD 6-18 dollars/tonne. It is an inherent solid state fuel storage, enabling on demand generation of acetylene fuel, which has 14 % more calorific value than gasoline, and is 10 % lighter than air, making it easily manageable. The solid state calcium carbide cartridges contain 37.5 % of fuel by weight as compared to 4% hydrogen in a pressurized fuel tank. CaC2 is also non-combustible and not subjected to the volatile markets as it is not a petroleum source, making it ideal. The positive enthalpy from the production using abundant coal and calcium oxide, makes energy recovery possible. The acetylene produced also requires lesser oxygen demand at a ratio of 13:1 as compared to gasoline’s 15:1, reducing knocking and incomplete ignition during combustion. The Ca(OH)2 produced early can be used to trap exhaust gases such as CO2, to form CaCO3, and also to regenerate additional calcium carbide by charging carbon into it from this process. A sketchup on the water-powered acetylene engine is illustrated in Scheme 3. Scheme 3. Concept of a water-powered acetylene engine with zero emissions. Energy efficiency for gasoline and acetylene is 52.32 and 80 MJ/L. Therefore, acetylene fuel can run 1.5 times longer distance. Weight of one small car is 2.7 tons, and average running distance is 400 km, so full tank of acetylene can run around 600 km. We also compared weight differences between gasoline and acetylene-powered engine. Existing configurations for fuel injection in a gasoline-engine will be adapted for acetylene. Typically, the weight of the car is weighed down by the fuel tank and its content. Energy-to-weight ratio is a calculation commonly applied to engines and mobile power sources to enable the comparison of one unit or design to another. For example, the total weight of a gasoline engine is approximately 150 kg, the fuel tank is 20% of the total weight of the engine at 30 kg. Adapting the gasoline-engine features with a 40 litre fuel tank, the weight of calcium carbide fuel is only 58 kg more, which is equivalent of carrying an additional passenger, and does not reduce running efficiency. In fact, the energy-to-weight ratio of a regular sedan car at 2.7 tonnes using gasoline is at 19.4 MJ/tonnes as compared to the 50 % increase in a acetylene-based engine at 29.6 MJ/tonnes. Thus the acetylene-powered engine may represent an increase in energy per weight ratio and allow longer travel distances. When driving the same distance, acetylene energy is 64 times cheaper than gasoline. Acetylene may accumulate when insufficient oxygen enters ─── Incomplete Combustion: With the advent of technology, the full combustion of acetylene can be achieved with the use of an efficient air-fuel mixture via an air-twirl technique. Auto water sprayer controlled by acetylene gas pressure meter with separated water/fuel system can be adopted ─── Controlling Production of Acetylene: There is a need to design a safe acetylene generator, which can be achieved by a separated water/fuel system, where we gradually add water to calcium carbide. We aim to let people be more receptive to our new acetylene engine, through private-public partnerships (PPP) and creating shared value with our consumers. 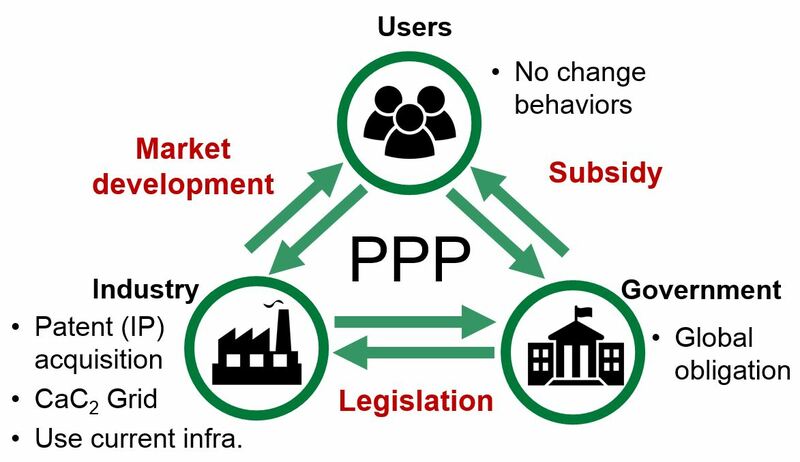 Stakeholder analysis of adoption is considered to be collaboration with public–private partnership (PPP), as illustrated in Scheme 4. Within this PPP circle, firstly industry has to make it as a product and replace current gasoline. For all stakeholders, as long as there are benefits, they are willing to adopt the action plan, making it easy to commercialize. Government: Provide subsidies to support customers, and meet global obligation of reducing carbon footprint. Industry: Patent acquisition and realization of CaC2 grid. Scheme 4. Public-Private Partnership in a carbide economy. The action will principally be tested out in European Union. In particular, we handpicked the megacity in France, Paris. In this city of over 10 million people, there has been a high density of car owners, numbering at 1 for nearly every 2 residents. The data is extracted from Paris dated 1 Jan 2012 (Eurostat). In France, there are 6,962,000 vehicles registered in Greater Paris, a region of 12,292,895 people. The Environmental Protection Agency of the United States of America (2010) have studied that for cars travelling at 255 g/km for CO2 emission with a mileage of 18354 km, the total CO2 released is 4.7 tonnes. In our foreseen calcium carbide driven economy, we foresee a 5 % reduction of the carbon footprint, where there is a saving for 1.64 mega tonnes of CO2. Working with existing infrastructure we foresee a possible scalability of calcium carbide refuelling stations as seen in Scheme 5. 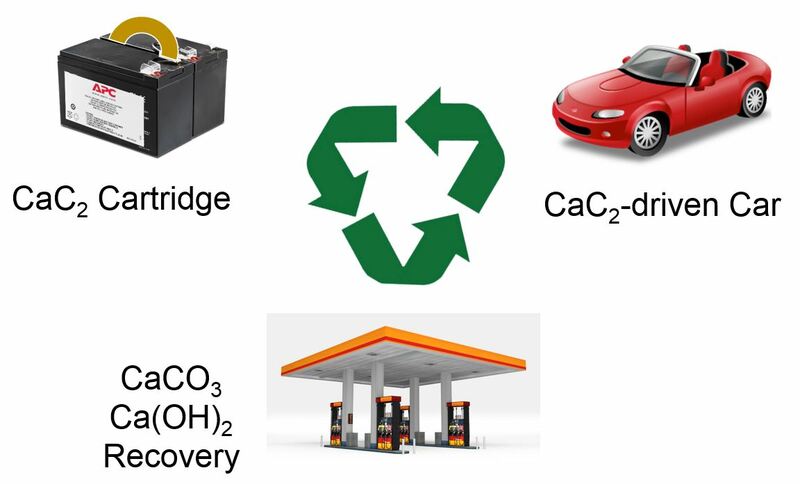 The ready conversion of petrol kiosks to CaC2 refuel stations and future transport of derivatives of calcium carbonate for recovery of Ca(OH)2 at centralised processing units is extremely attractive. This CaC2 ecosystem can also be linked with the green energy grid, paving way to an alternative storage of clean energy in CaC2. Scheme 5. Scaling of calcium carbide economy with existing infrastructure. Based on know-how since 1900s,  making it easy to implement to vehicles with current technique. Cartridges for refuel will be placed amongst gas refuelling stations for these purposes, as illustrated in the carbide economy in Scheme 6. People do not have to change their behaviours because they can still drive their private vehicles, only with engine changed. Moreover, our new engine can let people drive longer distance compared to the same volume of gasoline, saving drivers' time, so we believe this idea can be easily implemented and accepted by the public. The mobility in the future will be a green engine, and lead our life to a new generation. ​CaC2 cartridge in the vehicle can be easily taken out to refuel in short time at “Calcium Carbide station”. Developing a new market and creating jobs. Developed countries: convenient, safe, and willingness to try new technology. Scheme 6. Eco-system in a calcium carbide economy. We intend to build up a patent for the technology that we have proposed. Winning the MIT CoLab enables me to apply for the necessary funding to continue to fund this research and display a working prototype in 5 years. Herein, I hope to apply for a research grant of USD 621 800, to ask for essential manpower and expertise to develop the technique. My motivation is to develop a prototype, so that we can have enough hard evidence for a demonstration unit. We intend to demonstrate the proof of concept of a water-driven acetylene generator and an in situ carbon capture mechanism within cars. A design of the acetylene chamber where we will be able to load the cartridges without the need for excessive waiting time during refueling will be shown. Furthermore, we intend to advocate a living and dynamic eco-system for such a fuel to thrive with the coexistence of contemporary infrastructure. Such a grid gives empowerment to the people, who finds refueling a chore. This acetylene engine chamber is compatible to most ignition-spark engine. The cartridges of calcium carbide can be loaded into the chamber of the acetylene chamber. These retractable cartridges are able to work side by side with existing infrastructure, like gas stations. The entrapped carbon dioxide in calcium carbonate can also be unloaded and sent in for recovery at plants or serve as permanent CO2 sinks. We will be building a mock-up model of these retractable systems of acetylene generator by 3D printing. This new model of travel will eventually be plied to new customers who are savvy to green technologies. They will be our target crowd as first adopters, before moving along the chains to the masses. Over a medium term period of 15 years period, we hope to implement it to the city of choice, Paris and a gradual entry globally. At the start of a long term timeline of 50 years, we endeavor to build on an enduring economy carbide economy that strive to bridge the gap between the current economy based on fossil fuels and the future economy of the sun, using renewables. All the three above projects dealt with modifying existing vehicles, so that they are compatible with the infrastructure of today’s society. Hilden, D. L.; Stebar, R. F. Int. J. Energ. Res. 1979, 3, 59. Lakshmanan, T.; Nagarajan, G. JJMIE 2009, 3, 125. Han, S.-J. ; Yoo, M.; Kim, D.-W.; Wee, J.-H. Energy & Fuels2011, 25, 3825. Schlapbach, L.; Zuttel, A. Nature 2001, 414, 353. Paris data from 1 Jan 2012 (Eurostat) In Paris, there are 6,962,000 vehicles registered in Greater Paris, a region of 12,292,895 people. Environmental Protection Agency of the United States of America (2010). For cars travelling at 255 g/km for CO2 emission with a mileage of 18354 km, the total CO2 released is 4.7 tonnes. For a 5 % reduction of the carbon footprint, there is a saving for 1.64 mega tonnes of CO2.